A world-renowned author and activist explains why women can be free and thrive only in secular societies. Crisis pregnancy centers try to trick women out of having abortions—and more than ever, they’re a big business. Efforts to distance contraception from abortion have created a false dichotomy that ill-serves real women, who may turn to contraception or abortion to regulate their fertility. The violence of ISIS is deeply rooted not just in Islam but in the entire Abrahamic religious tradition. Though he is now dead, the rationalist activist known as Periyar still influences social change in India. Krishnasamy Veeramani is a lawyer turned social activist who fights for humanism in South India. The historical evidence as well as theoretical considerations should make it perfectly clear that the search for truth is not a morally or politically neutral endeavor. Schweitzer’s very influential critical account of Jesus includes much of importance that more recent scholarship accepts, as well as elements that have undertsandably found little favor. Conceding from its opening move that humanism is a religion, the American Humanist Association damaged the movement while defending one prisoner’s rights. Americans are fooling themselves if they think they can escape disease threats in far-off lands. Getting atheists to talk about death is hard—but vitally important for the movement. Who Is Really Gross and Racist? The concerns of those worried about insulting Islam are seriously misplaced. 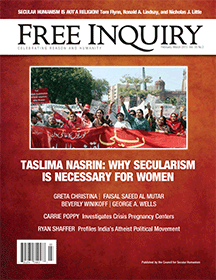 Letters from the February/March 2015 issue of Free Inquiry, in response to the December 2014/January 2015 issue. A call for concern on climate change and a look at the November election results. The delights of this life are not perfect and far from perfectly distributed; but since they’re all the heaven we get, let’s appreciate them deeply. At long last, a look at the Garden of Eden story from the serpent’s perspective. A review of The Necessity of Secularism: Why God Can’t Tell Us What to Do, by Ronald A. Lindsay. A review of Nature’s God: The Heretical Origins of the American Republic, by Matthew Stewart. A poem from the February/March 2015 issue of Free Inquiry.